Doomsday Cults and Secret Fish: Rising Richmond Comic Artist Megan James Finds Humor in the Apocalyptic | Arts and Culture | Style Weekly - Richmond, VA local news, arts, and events. Scott Elmquist Local artist Megan James holds her H.P. Lovecraft-inspired comic book, “Innsmouth,” at Velocity Comics. Her work was featured this year alongside other gay creators for Pride Alley at Awesome Con in Washington. 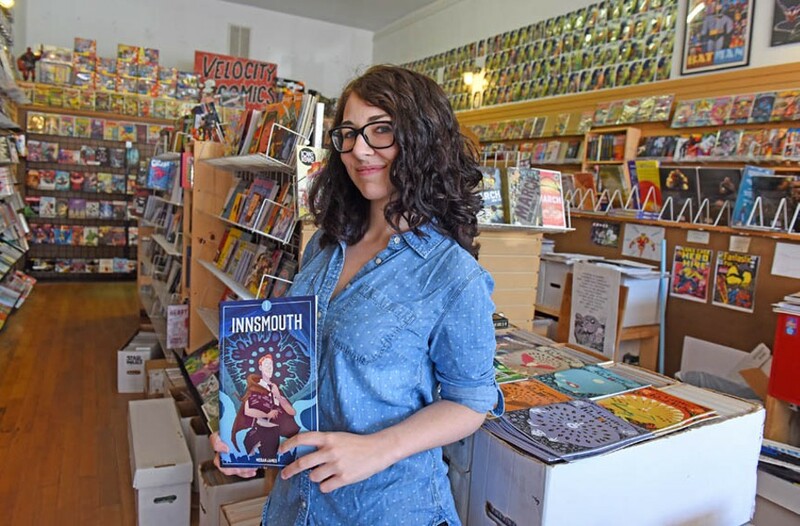 Last fall, Megan James was expecting to leave Velocity Comics on Broad Street with a small purchase. She walked out with a comic book deal. Really, who could turn down a series about fish people? “I’m still amazed I had the balls to do that,” says James, who cold pitched her story to James Moffitt, founder of Sink/Swim Press. She produced an issue two months later, which promptly sold out. Moffitt says James’ fast-rising status is “pretty incredible for a new artist.” Critics have called her Innsmouth series a sublime satire of author H.P. Lovecraft, who heavily influenced pop culture depictions of aliens and monsters. “Innsmouth” is set in the fictional New England town described in Lovecraft’s 1936 novella, “The Shadow over Innsmouth.” The original story is about a community full of fish people in disguise, which James says is unintentionally hilarious. Harnessing that paranoia, she dreamt up Randolph Higgle, a door-to-door doomsday cultist. The series dives into Higgle’s psychology — and his change of heart about activating the apocalypse. Three issues have been released, and this summer James is figuring out how to wrap up the final two issues. She’s looking everywhere for inspiration, including a visit to Newburyport, Massachusetts, the town that inspired Lovecraft. “I was privately jazzed to be there, on a secret mission,” says James, who recently graduated from Virginia Commonwealth University. “Although, when I bought a historical map of the place, the guy in the shop asked me, ‘Do you live around here?’” It was a very Lovecraft moment, she says. The Innsmouth issues have about 40 pages each, twice the length of typical comic books. James works fast initially, penciling out all the pages in two to three days. She developed her chops partly through the advice of popular Web artists. She says Lars deSouza is one such motivational figure. He would respond to James’ questions during live-streamed drawing sessions. Today, readers can detect deSouza’s influence on the faces of James’ characters, which are carved with jittery intensity. But the architecture and the landscapes of Innsmouth may be the attraction for some readers. “Her style is so precise,” says Ken Hopson, an innovative media manager at Virginia Commonwealth University’s James Branch Cabell Library. In the finished product, each cobblestone and every leaf is rendered with utmost care. As the world of small press artists has gotten increasingly competitive, James has sought out smaller conventions, like the Massachusetts Independent Comics Expo. She says she’s fine with that. First of all, James likes the irony of selling a small town Massachusetts storyline at a little expo in that state. Second, she says that she ends up finding more meaningful paths to the bigger conventions. This year, for example, her work was part of Pride Alley at Awesome Con in Washington. The showcase placed her alongside other gay creators who satirize the status quo. “It’s just another part of who I am,” she says. Lovecraft is controversial in the comic book world because of his real-life fascination with cultural purity. James recommends Victor LaVelle’s “The Ballad of Black Tom” and Matt Ruff’s “Lovecraft Country” for “people taking smart approaches to tackling Lovecraft’s giant amount of problematic baggage.” Film rights for the latter were recently bought by Comedy Central star Jordan Peele, whose smash directorial debut “Get Out” is a modern horror tale that scored huge at the box office. There’s no copyright risk for riffing on Lovecraft, of course. People have asked James to write short stories that would expand the Innsmouth narrative. She’s into the idea and has already spun off her main characters for a series of funny Valentine’s Day cards. For now, though, she’s searching far and wide for her summer muse.